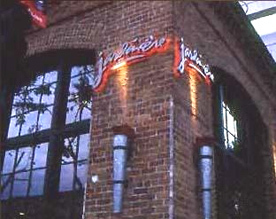 Chef/Co-Owner Traci Des Jardins' award-winning restaurant, Jardinière, in San Francisco, California features elegant dining with talented Executive Chef Craig Patzer in the kitchen, Sommelier Eugenio Jardim in the wine cellar, a hot lounge with creative mixologists, and a tempting cocktail menu. I had the opportunity to meet Traci Des Jardins at the 2007 James Beard Foundation Awards when she won Best Chef of the Pacific in 2007, and had eagerly looked forward to experiencing Jardinière the next time that I was in San Francisco, as the restaurant's focus is to "support local farmers, fishermen, and ranchers who produce their food in a sustainable manner." 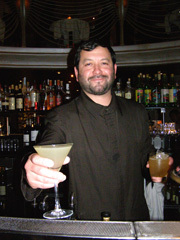 I finally took a trip to San Francisco in late January 2009, and as I had expected, the restaurant lived up to my expectations. 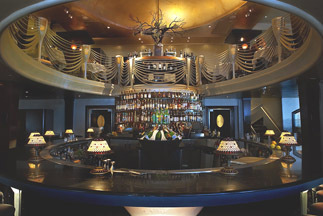 The visually appealing restaurant has interesting architectural details, features a talented team in the kitchen, behind the bar, and extends to the professional wait staff. There are also wonderful little surprises at the restaurant, including that Chef Craig Patzer makes all of the charcuterie for the restaurant, and that the restaurant boasts a walk-in cheese cave. When Edward and I walked into Jardinière and saw the well-stocked horseshoe bar illuminated with Tiffany style lamps, we knew that was where we had to begin our evening. Ruben and Amy, the personable and talented duo behind the bar on the night we had dinner, made us feel like we were San Francisco regulars. After perusing their extensive cocktail menu list of Modern Classics, Classics, and Originals, we decided to sample two of Jardinière's original cocktails, The Pony Express (Jardinière's Barrel Selection of Sazerac, Rye, Qi White Tea Liqueur, Organic Maple Syrup, and Lemon), and Tippler's Delight (Navip Slivovitz 8 Year, St. Germain Elderflower Liqueur, Lemon, Pernod Absinthe). Sitting at the bar, we were able to appreciate all of the subtle details of the restaurant, where the ebb and flow of the patrons kept the bartenders squeezing fresh citrus for the cocktails, and the servers delivering one gorgeous creation after another, deliciously tempting our palates. Cocktail hour over, the hostess brought us to our table located on the second floor, reached by climbing a cream colored draped wrought iron stairway. 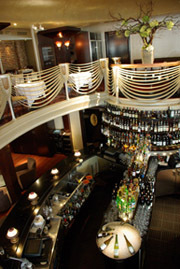 The attractive restaurant features exposed brick walls, patterned sheers at the windows, pink tinged scallop shaped sconces on dark wood pillars, fairy lights illuminating the room, domed rotunda ceiling, dark carpet, and tables dressed with ivory linens and votive candles, with wine buckets ingeniously incorporated into the wrought iron railing. Our server, Michael, began our Jardinière dining experience with aperitifs of Veuve Fourny Brut Blanc de Blancs "Premier Cru" Vertus, France, NV, 12% alcohol, to accompany the Amuse Bouche of Blini topped with minced egg white, chopped herbs, and crowned with Tsar Nicoulai Estate Caviar from California sturgeon from a sustainable farm, which was a perfect little greeting from Chef Craig Patzer. 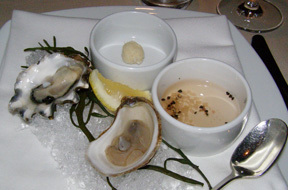 Edward continued with a first course of St. Simone and Chelsea Gem Oysters on the Half Shell with Champagne Mignonette and Fresh Horseradish attractively presented on a bed of salt with a strand of seaweed, lemon wedge, bowl of fresh horseradish, and a bowl of champagne mignonette. I had Seared Bigeye Tuna, Tapioca, Apple, and Jalapeño, Tsar Nicoulai Caviar presented as two slices of tuna topped with tiny-diced apple, jalapeño, and caviar, and garnished with tiny herb leaves on a rectangular white plate. For his second course, Edward had the Housemade Potato Gnocchi, Braised Octopus, Niçoise Olives, and Calabrian Chilies, which were lovely pillows of tender pasta served with a flavorful sauce garnished with basil, and paired with Inama Soave Classico, "Vigneti di Foscarino" Veneto, Italy, 2006, 13.5% alcohol. I had the Little Gem Lettuces, Chioggia Beets, Avocado, and Piave Vecchio Cheese, which was a gorgeous salad with quartered beets, wedges of avocado, and large shaved slices of cheese that was a delicious taste of California, that was well paired with an Albariño Do Ferreiro Rias Baixas, Spain, 13.5% alcohol. 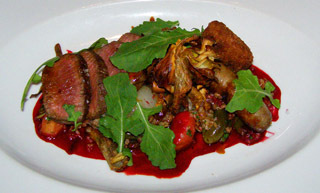 As a main course, Edward selected Prather Ranch Lamb, Crispy Artichokes, Bulgar, and Lucques Olives with Beetroot Purée paired with a Catena Malbec, Mendoza, Argentina, 2006, 13.5% alcohol, that was another winner and gorgeously presented with tender slices of lamb and mélange of vegetables. 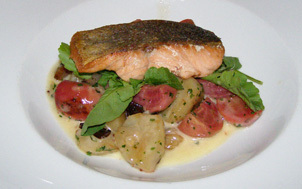 I had the Steelhead Salmon, Chioggia Beets, Sunchokes, and Mustard Beurre Blanc that was well matched with a Freeman Vineyard and Winery Pinot Noir, Russian River Valley, California, 2006. This course was attractively presented in a deep white bowl with buttery and tender salmon on a bed of beets, with sunchokes, olives, and mixed greens on a rich mustard beurre blanc pool. 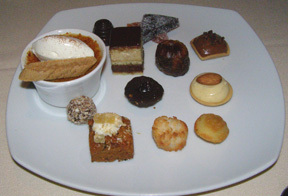 We ended the evening on a deliciously sweet note with a lovely plate of Mignardises that included madeleines, financiers, cocoa nib, crème brûlée, macaroons, chocolate tart, fruit jellies, and carrot cake, which were perfect little bites of pleasure. Read about Jardinière in the Chefs' Recipes section where Chef Craig Patzer and Sommelier Eugenio Jardim shares a delectable taste of Jardinière.